Designed for the heavier usage involved on professional building sites. This all steel taper mo.. Designed for the heavier usage involved on professional building sites. This all steel square m.. The pointed blade offers easier penetration in tougher ground. Used for excavating, digging and..
Used for digging and excavating small trenches where the pointed blade gives better penetration .. Designed for the heavier usage involved on professional building sites. This all steel cable la.. Designed for the heavier usage involved on professional building sites. This all steel trenchi.. Designed for the heavier usage involved on professional building sites. The all steel solid soc.. Designed for heavier usage involved on professional building sites. This all steel newcastle dr..
An all steel shovel is a tool used for digging, lifting, and moving bulk materials. Shovels are common utensils due to their effectiveness in many manual applications, including extensive use in agriculture, construction, and gardening. Most of our shovels consist of either a broad blade (Most effective for lifting, moving, and transport of materials, and also digging large areas, especially when the ground is soft.) or narrow blade (Narrow blades will cut through the ground easier, due to a smaller surface area to impact ratio, making the labour involved in digging narrow channels effortless.). Either broad or narrow blades are fixed to a medium-length handle, with all blades in this category being made of sheet steel, to ensure that they are very strong. Shovel handles are made of wood, with the shaft also being made of steel for extra durability. These hand shovel blades have a folded seam, or hem, at the back to make a socket for the shaft. This fold provides extra rigidity to the blade, with handles being riveted in place. The handles are of a 'T-piece' design and are fitted to the end of the shaft, to aid grip and control when using the shovel. This is especially useful when moving soil, cement, or other heavy materials. 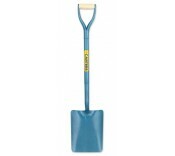 These multi-purpose steel shovels are adapted for many different tasks and environments. We have shovels optimized for a single task (such as our cable laying and Newcastle drainage shovels), and shovels designed to compromise as tools for multiple differing tasks (i.e. general service and square mouth shovels).